Progressive CIO's want out of the data center market, at least data centers as we have known them for the past few decades. The CIO's vision is for an autonomous data center; a data center that operates without the constant supervision of storage, network, database and exchange administrators. A data center that virtually runs itself; automatically adjusting compute, networking and storage to adapt to the changing demands of the applications and services critical to the success of the business. So how do large enterprises, burdened with security, compliance, application interdependency, and legacy architectures, begin building towards an autonomous data center? How does the CIO begin thinking strategically about the evolution of the data center and understand the building blocks that will be needed to one day achieve this vision? 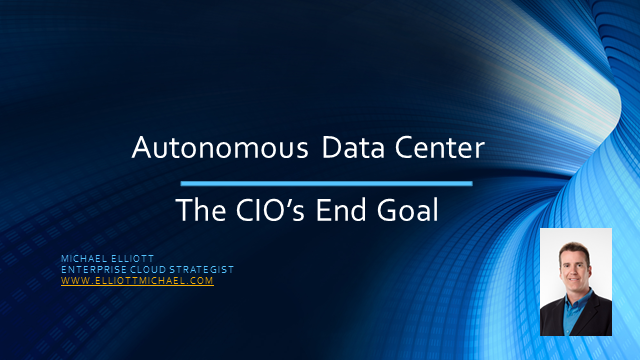 In this webinar, we'll begin the journey by defining the autonomous data center, understanding the strategy required for realizing this vision, and exploring the ultimate impact to IT.